Date: 21st June 2014:- Theory Date Sheet for Bachelor in Computer Application (BCA) 5th Semester Scheme Examinations June, 2014. Date: 21st June 2014:- Theory Date Sheet for MHM 3rd Sem. (2011-13 batch) Examinations June, 2014. Date: 12th June 2014:- Date Sheet of M.Ed & D.Ed Examination June,2014. Date: 12th June 2014:- Theory date sheet for B.A (Hons.) IInd Year Improvement/Reappear (Mercy Chance) Examination to be held in June, 2014. Date: 12th June 2014:- Theory date sheet for B.Com IInd Year Pass Course/ Improvement/Reappear (Mercy Chance)Examination to be held in June, 2014. Date: 12th June 2014:- Theory date sheet for B.Com (Hons.) IInd Year Improvement/Reappear (Mercy Chance)Examination to be held in June, 2014. Date: 31st May 2014:- Theory date sheet for B.Sc. Home Science IInd Year Pass Course/ Improvement/Reappear (Mercy Chance)Examination to be held in June, 2014. Date: 31st May 2014:- Theory date sheet for M.A./M.Sc./M.Com (Final) Re-Appear/Improvement/Mercy Chance Exams. June, 2014 (with Maximum Marks 80/100 Scheme) : Please insure your paper in date sheet with Paper ID No. mentioned in your Roll No. Slip. Date: 31st May 2014:- Theory date sheet for M.A./M.Sc./M.Com (Previous) Re-Appear/Improvement/Mercy Chance Exams. June, 2014 (with Maximum Marks 80/100 Scheme) : Please insure your paper in date sheet with Paper ID No. mentioned in your Roll No. Slip. Date: 31st May 2014:- Theory date sheet for M.A./M.Sc./M.Com (Previous) Fresh/Current (w.e.f. 2014) DDE Exams. June, 2014 (With Maximum marks 100 scheme) : Please insure your paper in date sheet with Paper ID No. mentioned in your Roll No. Slip. Date: 31st May 2014:- Theory date sheet of M.Phil 2nd Sem. Examination June, 2014 : Please insure your paper in date sheet with Paper ID No. mentioned in your Roll No. Slip. Date: 31st May 2014:- Theory Date Sheet of M.A/M.Sc/M.Com (Final) (DDE) Exams, June, 2014 : Please insure your paper in date sheet with Paper ID No. mentioned in your Roll No. Slip. Date: 31st May 2014:- Theory Date Sheet of M.A/M.Sc/M.Com (Previous) (DDE) Exams June, 2014 : Please insure your paper in date sheet with Paper ID No. mentioned in your Roll No. Slip. Date: 31st May 2014:- Theory date sheet of P.G. Diploma Examination June, 2014 : Please insure your paper in date sheet with Paper ID No. mentioned in your Roll No. Slip. Date: 31st May 2014:- Theory date sheet for B.A./B.Sc (Hons.) IIIrd Year Improvement/Reappear (Mercy Chance) Examination to be held in June, 2014. Date: 31st May 2014:- Theory date sheet for B.A (Hons.) Ist Year Improvement/Reappear (Mercy Chance) Examination to be held in June, 2014. Date: 31st May 2014:- Theory date sheet for B.A/B.Sc. Ist Year Pass Course/Additional/Improvement/Reappear (Mercy Chance) Examination June, 2014. Date: 31st May 2014:- Theory date sheet for B.Com IIIrd Year Pass Course/ Improvement/Reappear (Mercy Chance) Examination to be held in June, 2014. Date: 31st May 2014:- Theory date sheet for B.Com (Hons.) Ist & IIIrd Year Improvement/Reappear (Mercy Chance) Examination to be held in June, 2014. Date: 31st May 2014:- Theory date sheet for B.Com Ist Year Pass Course/ Improvement/Reappear (Mercy Chance) Examination to be held in June, 2014. Date: 31st May 2014:- Theory date sheet for B.P.Ed. Ist Year Improvement/Reappear (Mercy Chance) Examination to be held in June, 2014. Date: 31st May 2014:- Theory date sheet for B.Sc. Home Science Ist/IIIrd & B.Sc Sports Science Ist Year Pass Course/ Improvement/Reappear (Mercy Chance) Examination to be held in June, 2014. Date: 31st May 2014:- Theory date sheet for B.A/B.Sc. IIIrd Year Pass Course/Additional/Improvement/Reappear(MercyChance) Examination to be held in June, 2014. Date: 31st May 2014:- Theory date sheet for C.P.Ed. Ist & IInd Year Improvement/Reappear (Mercy Chance) Examination to be held in June, 2014. Date: 28th May 2014:- Theory Date Sheet for P.G. Diploma of Psychology in Organization and P.G. Diploma in Guidance & Counseling Psychology Examination May, 2014. 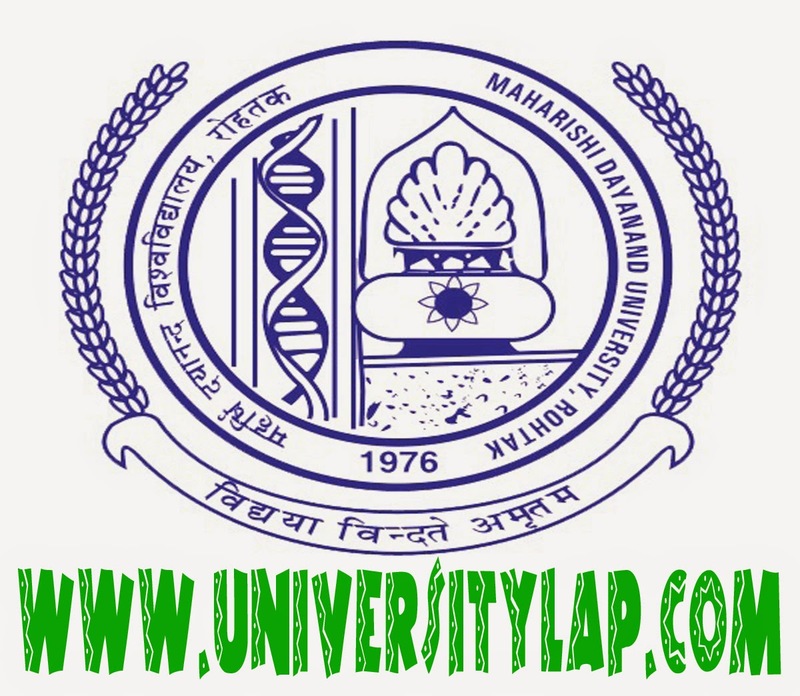 Date: 27th May 2014:- Theory Date Sheet for M.Phil 2nd Semester Examinations May/June, 2014. Date: 15th May 2014:- B.T.M 2nd, 4th & 6th Sem. Date: 9th May 2014:- Theory Date Sheet of M.A (Hons) (Public Administration) 5 year integrated course, Sem.-II Examinations May, 2014. Date: 9th May 2014:- Theory Date Sheet of M.A (Hons) (Public Administration) 5 year integrated course, Sem.-6th Semester Examinations May, 2014. Date: 16th April 2014:- Theory date Sheet for B.A/ B.sc (Re-Appear) Part-I (Hons.) Annual Examination May, 2014. Date: 16th April 2014:- Theory date sheet of B.Com (Pass , Vocational & Hons.) 6th Semester Examinations to be held in April, 2014. Date: 16th April 2014:- Theory date sheet of B.A. (Hons.) 6th Semester Examinations to be held in April, 2014. Date: 27th March 2014:- Theory Date Sheet of MBA (Industry Integrated) 4th Semester (New Scheme & Old Scheme) Examinations to be held in April, 2014 : "FOR NIAM STUDENTS ONLY"
Date: 27th March 2014:- Theory Date Sheet of B.B.A. (Industry Integrated) 6th Semester Examinations to be held in April, 2014 : "FOR NIAM STUDENTS ONLY"